Have you seen the fresh new care for stunning hair? Get to your nearest Walgreens, and try some of the season’s hottest new hair care products. Breathe life into lifeless, flat hair with the new Dove® Advanced Hair Series with Oxygen moisture. Dove’s Pure Care Dry Oils are made from first-pressed organic oils which are absorbed in an instant to nourish and pamper hair and leave it looking smoother, shinier and softer from the first use. Get salon-gorgeous hair every day with TRESemmé® Keratin Smooth. With the new 7 Day Smooth line extension, you’ll have ultimate frizz resistance that lasts through washes. I have been using the all of these products for awhile now. I really have noticed a huge difference on how shiny and smooth my hair is lately!! I was very impressed with all the products, and I know they will stay in my normal beauty and hair care routine! TRESemmé® Keratin Smooth 7 day treatment- Since I have pretty long hair it only lasted me 3 days rather than a full seven. Using this treatment has brought life back to my hair! This winter it has been really hard on my hair. Suave Natural Infusions– This weightless styling oil is infused with Moroccan Argan Oil! If you have ever used Moroccan oil you know how awesome it is. This product really has given my hair a really nice smooth silky shine to my hair!!! Plus it is a product that won’t weigh down the hair, which is really nice! Dove Advance Hair Series Oxygen Moisture- This is a leave in foam that helps add moisture and gives your hair a light hold. It says it can give up to 95% more body and fullness! I have never straight hair so I can use all the help for volume!! Plus I think this has helped keep my curls in through the day!! When you buy any these new products at Walgreens, you’ll get amazing savings! I am really loving Walgreens Balance Rewards, I have really gotten a lot back from them on my shopping trips! 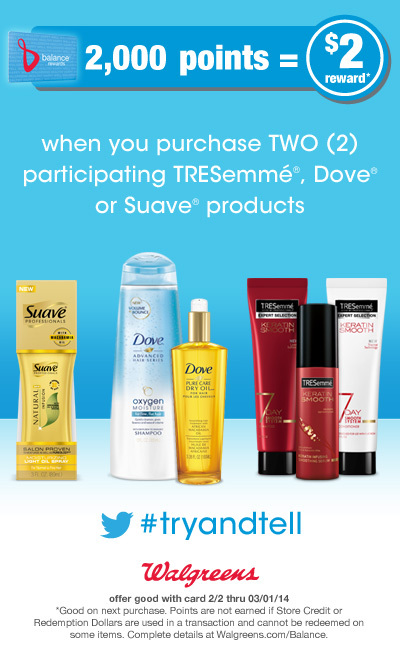 Buy two participating TRESemmé®, Dove® or Suave® products, and get 2,000 Walgreens Balance Rewards points. That’s a $2 reward! Want to hear what others are saying about these new products? Get the inside scoop by searching #TryAndTell on Twitter. Plus, you can win new product packages and Walgreens gift cards during one of our live Twitter chats, and hear what people are saying in real time about their favorite brands. Make sure to follow them all on twitter! 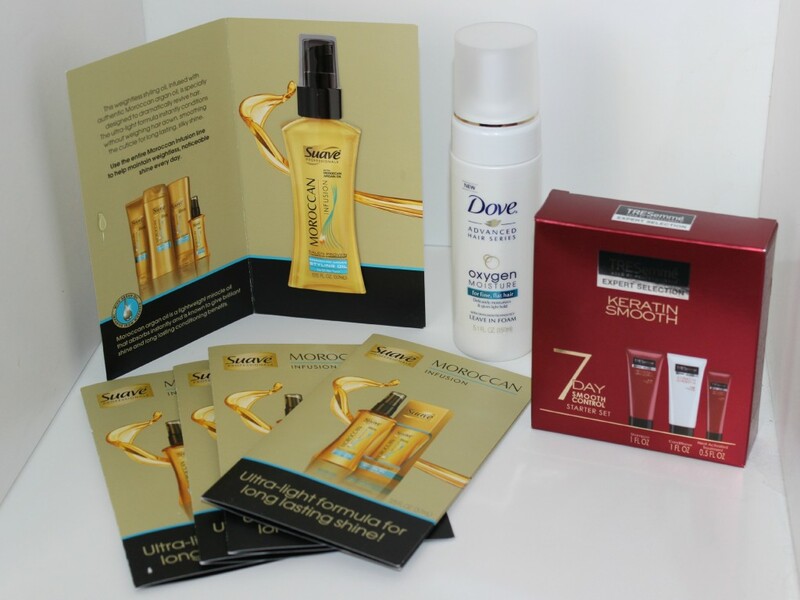 Love Dove products they are definitely my preferred choice! I’ve used both Suave and Dove products for men and found them to be really good. I’ve always loved Dove for skincare. Must check it out for haircare too. 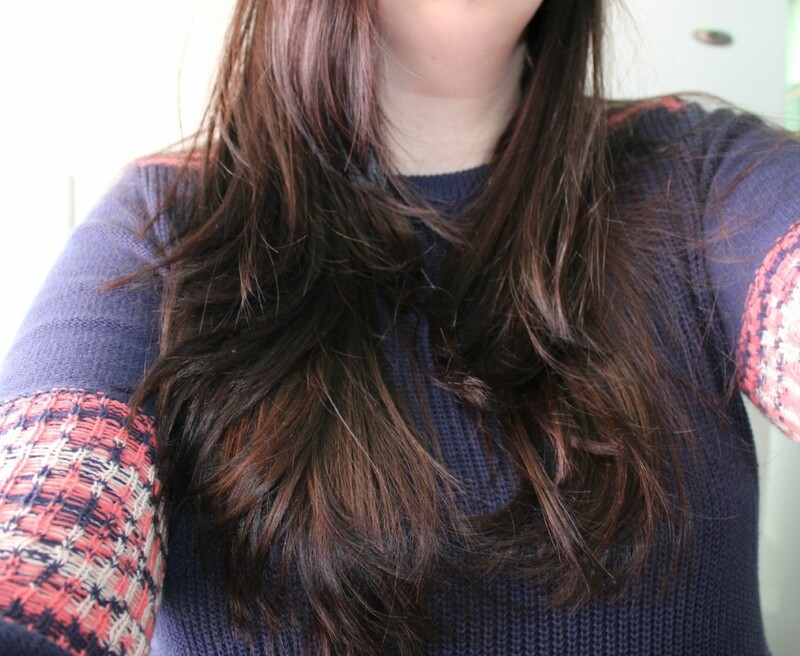 I love the way the Dove hair care products leave my hair feeling after I use them! Wow, you have absolutely gorgeous hair. 🙂 I need to try Dove! Aw thank you so much Nancy!!! I love TRESemmé products. They’re so affordable and I love the way my hair looks, too. Suave has really stepped up their game, too, with the professionals line. Oh your hair looks so smooth and silky! I need my hair to look like that! I want to try the Keratin Smooth kit! I enjoy using Dove products but haven’t tried these yet. I need to do something to give me some shine!! Oh wow, your hair looks amazing! I need to try that! Your hair looks really great! Wow, your hair looks absolutely amazing! I am going to have to try that out, I am always looking for new hair care products! Oooh, you have beautifully shiny hair! Love these products!! Your hair does have a beautiful shine! My hair always looks so dull and lifeless. I have thick coarse hair so I’m absolutely going to try that keratin treatment on mine! It needs help! I love how healthy your hair looks! You have gorgeous hair! Dove is among my favorites to use when it comes to how it makes my hair feel.